Member NRENs, Regional RENs, partners, stakeholders, researchers and the global scientific community will soon be able to get all information about UbuntuNet Alliance on a new website which is set to be launched soon. The new website is an upgrade from the current Drupal based platform which has been running on the company’s domain since 2008. The mobile friendly, highly responsive and social media integrated website will, apart from the usual content available on the current website, feature running research stories as they happen unlike the current one where stories are uploaded on the website and sent to users through the NUANCE newsletter on monthly basis. With the new website, the Alliance will be posting news updates in real time and the NUANCE newsletter will be sent out to users from the new platform using MailChimp. 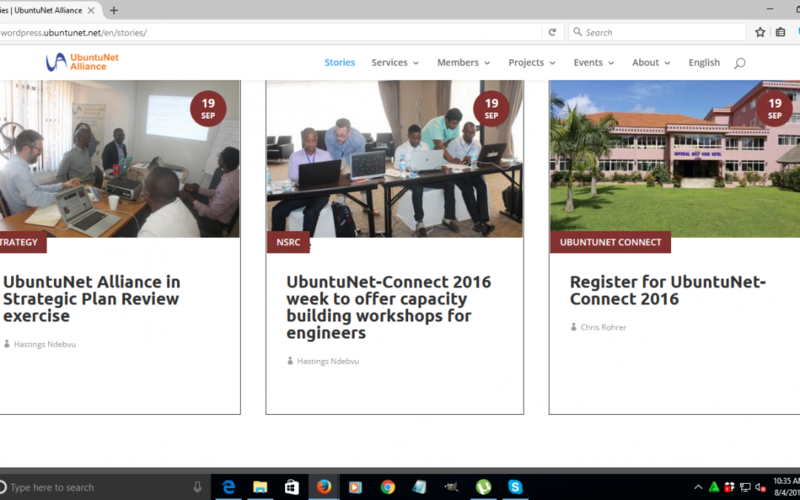 UbuntuNet Alliance Communications Officer, Hastings Ndebvu says the new website will improve the experience of end users as it has enhanced image and text features that offer easy, enjoyable and quick navigation.